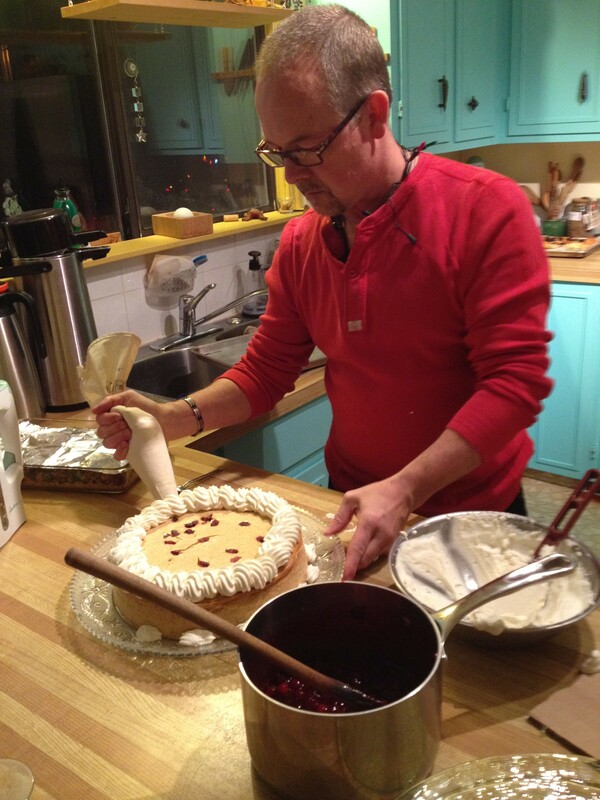 This recipe of Martin’s is one that never fails – he made cheesecakes for a living while he ran the kitchen at True Confections in Vancouver. Cheesecake is a stand-by at our annual Dessert before Christmas party. I particularly like this combination of flavours. Pour in your greased pan. Add raspberries in the pan and mix carefully so they go everywhere. Drop the chocolate chunks in the pan too – do not swirl. Bake at 325°F (160°C) for 1 hour and 15 minutes depending on your pan. Watch for an even motion on top. Loosen the cake from the rim of the pan; cool before removing from the pan. Decorate with fresh raspberries and whipping cream.